Si licet in vates, falsa subesse reor. Alpinum potuit, strictaque prata gelu? Si puer est, puerúm ne vocas qui Nestora vincit? An nosti Ascraei carmina docta senis? At pharetras & tela gerit, quid inutile pondus? An curvare infans cornua dura valet? Alas curve tenet, quas nescit in aethera ferre? Utilis est? ideo num minus ille videt? Cur age vivit adhuc? omnia flamma vorat. Naiadum quoties mollia corda subit? Du dieu damours, & sa facon. Jacoit quil soit de veue prive. 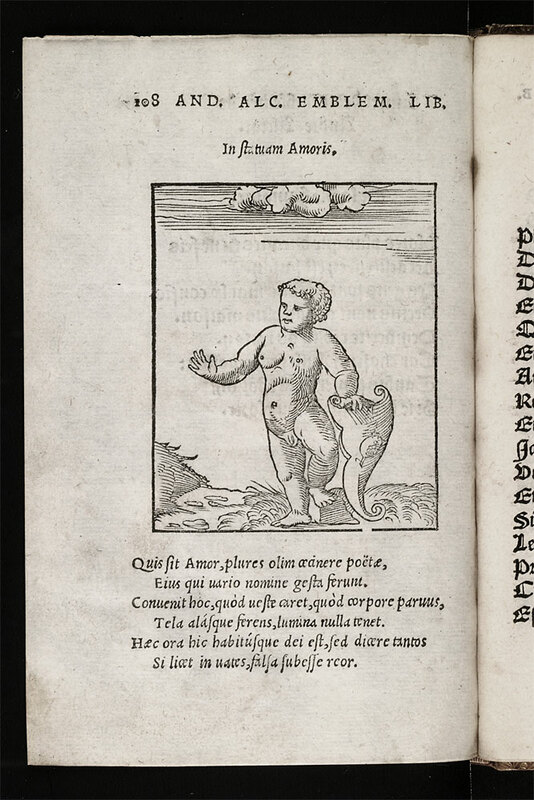 Link to an image of this page [O2r p211] Quil nayt point ung habillement? Ne tuast lenfant sans chemise. Veu que le feu a tout mort livre? Et ou sa vie tel feu rendroit? Sur Nestor, homme de grand aage. Et quon tenoit tresmeur & sage. Link to an image of this page [O2v p212]Dont nest vray semblable sentence. Car lenfant est plain de inconstance. Au moins a vaincre peu possible. A peine en rompt lon lentreprise. Et ne va pas fort hault en lair. Quil na gueres doyseaux blessez. A veoir ce, ou il veult lascher. Que de drapeau ses yeulx on bande. A tout ce quon a de luy dit. Gay en yver comme en este. En champ de sable qui dueil porte. 1. 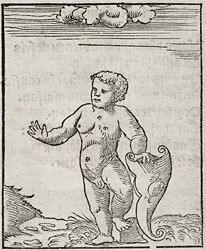 Before the 1536 Wechel edition, the figure had wings which were subsequently removed, such that the pictura fits the revised image of love discussed in the text rather than the conventional one. 2. ‘snows and North wind...fields stiff with frost’. These are traditional hardships endured by the hopeful lover who finds the door shut against him. See e.g. Horace, Odes 3.10. 3. Nestor, king of Pylos, who had outlived three generations of men, was a proverbial example of extreme old age. 4. ‘the old man of Ascra’, i.e. the poet Hesiod who, at Theogony 120, describes Love as a primeval cosmic force. 5. The liver was held to be the seat of the affections. 6. ‘hurts the mortal hearts of men’. Cf. Anthologia graeca 5.10, where Love attacks men, not animals. 7. ‘the...hearts of the Water Nymphs’: a reference to the many legends of water nymphs and other water spirits succumbing to love. 8. ‘Punic fruit’, i.e. the pomegranate. Possibly the connection here is the rough aftertaste it leaves and the likelihood of it being bad under its smooth skin. The pomegranate is a symbol of Aphrodite, the goddess of love.